Home / How Can I Test My Website Before Switching DNS? When transferring to a new hosting provider, the most important thing for you to do is to test your website before pointing your domain. This will help guarantee a successful migration by ensuring your site is 100% functional before making the switch. Your GreenGeeks service server IP. You can find this in your service welcome email, or by contacting support to confirm the correct IP address you’ll need to use. The best way to test your website is by staging your domain via your computer system’s HOSTS file. This method avoids having to wait for DNS propagation which could take quite a while. However, this will only work for the local system. If someone else would like to test the site, they will need to follow the same steps for modifying the HOSTS file. Open your text editor of choice. 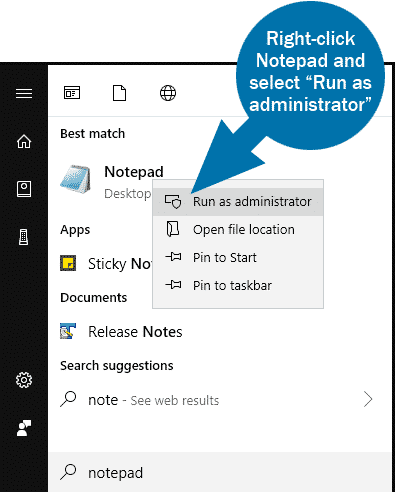 If you’re a Windows user, use Notepad with administrative privileges to modify the HOSTS file. If you don’t see anything in the etc folder, change “Text Documents” to “All Files” in Notepad. This will show everything in the folder including the hosts file. Note that SERVER_IP_HERE needs to be replaced with your actual server IP address. The ggexample.com references should be replaced with your actual domain name. Go to File and Save the hosts file. You don’t want to use “Save As” because you’re keeping the hosts file as-is with your added redirect entry. Restart your web browser and navigate to your website. The site will now load from the GreenGeeks server! To revert this change, simply remove the lines you added and save the file again. This will direct the site back to the original host. You may need to do this before visiting your domain registrar to change the nameserver. This doesn’t work on mac OS X because the host file is locked by the operating system and cannot be edited by any user not even an admin. Thanks for the suggestion. We already had “To revert this change, simply remove the line you added and save the file. This will direct the site back to the original host.” at the end of the article, but we’ve made it a bit more clear by adding it as its own bullet point. Without DNS pointed at the server though, we wouldn’t be able to install Let’s Encrypt certificates, correct?